Hello there & welcome to Sunday Suggestions! This is the first post in what I hope will be a regular series of columns appearing, funnily enough, on Sundays, with suggestions of awesome people and things to check out, read, participate in and follow. The idea for this came, as good ideas often do, during a late night discussion with my partner in the bathroom (like so many people, we swore we’d never descend to shared bathroom usage but eighteen months on from moving in together, we regular co-use the space – and not only that, it’s where some of our best conversations happen). There is just so much great stuff out there on the Internet, I wanted to gather some of what I’ve come across up in one place and share it with other people. Sunday is the usually the most chilled for a lot of people, with perhaps a bit more time available to read and explore, hence Sunday Suggestions was born! The lovely Terri Connellan over at Quiet Writing has penned a beautiful poem, Sapphire, and shared in a post called ‘Poetry into the light’. Her words, and the image, are so gorgeous. I’m also happy to report that the inspiration for the piece came from day 12 of the #experienceoctober2016 creative community challenge I’ve been involved in. It’s encouraging to see what a simple prompt such as sapphire can generate! On Tuesday, Catherine Gordon of Midlands Minimalist and I met up for our now regular lunch date and she was telling me more about her Life Energy (Expenditure) Experiment. During November, she will be anaylsing her purchases not by cost but by what value, fulfilment and satisfaction they have bought her. Sounds like both a challenging and illuminating experiment – and you can join in with! Click here for all the details about the experiment and getting involved. Last weekend’s Guardian magazine had a fascinating article about street names in Britain . Harry Wallop went beyond the obvious (1 Knob End, anyone?!) and explored the changing trends in naming patterns as well as the politics behind it all. A journalistic gem. Super coach and friend Anna Kunnecke has started a Wise Woman Book Club that will take place online, meaning any wise woman out there can join in! I’m so excited about joining in that even the not great time zone conversion will not perturb me. The first book is Glennon Doyle Melton’s Love Warrior, which has had some pretty spectacular endorsements (Liz Gilbert loves it). Louise Chunn, formerly editor of Psychologies magazine and now founder of Welldoing.org (to which I’ve recently become a regular contributor), has written a beautiful reflection on the coroner’s report into Sally Brampton’s suicide earlier this year. Regular readers will know that Sally and her work meant a huge amount to me. With Hallowe’en almost here I thought I’d share this post from last year which nails why I love this holiday *so* much! Also, if you share this or any other of my blog posts on social media (& tag me in the posts) between now & Friday 7th November then you’re in with the chance of winning a coaching package with me. All the details on my Coaching Giveaway page! 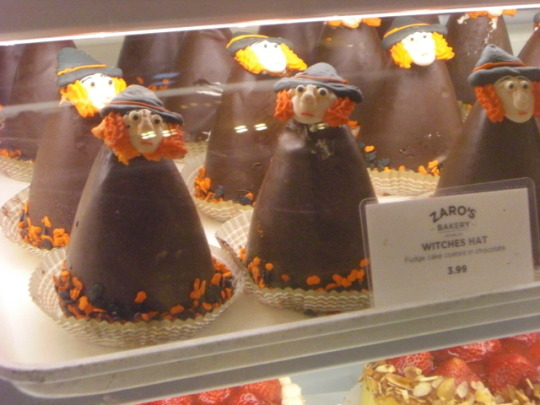 And this amazing witch confections aren’t even one of those three reasons! A last minute trip to the Cheltenham Literature Festival at the weekend immersed me a gorgeous cocoon of words, words, words and more words. Words to hear. Words to read. Words to ponder. Words to shock. Words that amused. Words that challenged. Words that touched. I’ve been ingesting words in the days since too. Reading lots, taking lots in. I’ve been pouring out words of my own, for private consumption (morning pages) and public viewing (my next contributions to The Huffington Post and Welldoing.org will be appearing soon). I’ve also finished working my way back through Susannah Conway’s awesome heart-centred business course, The Inside Story. If you run a biz that you regard as heart-centred then I cannot recommend this enough! So much juicy material; plenty to listen to, read and reflect upon. All good stuff but also meaning more words, words, words. I want a break from words for a while. I want to use other senses than just my eyes, so I tune into the music coming from the speakers above me in the coffee shop. Soothing piano sounds wash over me. Is it Chopin, I wonder, or perhaps Schumann? I don’t care really, I just like it. I’ve been thinking about music a lot lately since reading about how it can help people like myself who struggle with Borderline Personality Disorder. Apparently listening to music that is the opposite of how you feel helps to alleviate distressful moods. Makes total sense, and it’s probably something we already know from our own experience. I’m sure we’ve all had days where we’re feeling grumpy and crap until we hear our favourite song on the radio and suddenly everything seems better in an instant. I was a latecomer to the world of playlists but the very first one I made unknowingly drew upon this wisdom about music. Called ‘Smile’, it was eight tracks that, funnily enough, made me smile. I used to listen to it during my early commutes up to Manchester from the Midlands. If these songs could make me jig on the damp train platform at 06:15 whilst waiting for the stopping service to change at Stoke then they surely had some magical power! And because I reckon that many of us could do with an injection of feel good-energy, I’ve shared this Smile list on 8Tracks. It’s free to listen to, no downloading of software required. Just follow the link! [It seems that some people have had trouble with the playback on 8Tracks, so I’ve added the list to Spotify too]. Tell me, what are the songs that always make you smile? Share your suggestions and I’ll put together a Smile II playlist….Maybe we could even get like the Now series and get up to number 94! [And here it is: Smile II on 8Tracks and Spotify. Thanks for the suggestions! Enjoy]. I’d also like to know if this topic of music and moods is something that you are interested in? I’ve been wondering about putting together a little e-course on the subject but want to gauge the potential audience first. Would you like to explore this further? Sign up to my mailing list to keep updated with all my blog posts as well as my other writing & offerings. Earlier I posted a round up of links to my own recent writings on mental health in honour of #WorldMentalHealthDay. I’ve not been alone in sharing on this topic; all day my Twitter feed has been full of awesome links and encouraging statements. Here is a collection of some that have caught my eye. Even if you don’t follow up any of the others, please do watch the video in the first link – watch the video then hug your loved ones especially tight. It provides a heartfelt but stark reminder that there’s more to mental health than public awareness days: it’s about people’s lives. Yesterday was World Letters Day. Today is World Mental Health Day. I know which is easier to write about but alas I cannot ignore this one. Neither, I dare to suggest, can you. According to the Mental Health Foundation, one in six adults had a mental health problem in the last week. I am one of them. You are bound to know others too, whether you realise it or not. One in six is a pretty big statistic. A grim one too. I wish I had wise words to offer about what we can do about it. All I do know is that talking about what’s going on is a vital step. Anything that chips away at the secrecy, stigma and shame surrounding mental health is a good thing. Making it okay to share our struggles benefits everyone. It brings at least some small relief to the sufferer whilst giving our friends and family an insight into what it feels like to live with these difficulties. I’d like to contribute to this conversation by sharing below links to pieces I’ve published this year about mental health (there are more forthcoming but owing to my wrestling with Borderline Personality Disorder they are not out yet. I’d say this is ironic but I’m not sure whether it’s Alanis Morrisette ironic or actually genuinely ironic). I’d also like to bring together useful contributions to this significant day in the mental health calendar. I’ll be looking out for articles, blog posts and social media shares to include in a round up this evening so please do check back later (around 20.30 BST). If you spot anything that you feel warrants inclusion in this list, please do let me know! I’m on Twitter, Instagram and Facebook, or you can email me. I hope that World Mental Health Day is a calm and even happy one for you. If you’ve found this post enjoyable or useful, please do share it using the social media buttons below. For more from me straight to your inbox, sign up for my monthly mailing. It includes exclusive offers and giveaways! Every single subscription makes a real difference to me and my work. You can also follow me and my freelancing adventures on Instagram, Twitter, Pinterest and LinkedIn. Sunday 9th October 2016 is World Letters Day. To mark the occasion, I thought I’d share the first letter I have sent from H in south Wales to D in Jersey in 1955. This correspondence was in suitcase retrieved from a skip by my dad in the late 1980s. The story of H & D fascinates me on a micro level (the personal story of their lives) and a macro one (what their lives tell us about personal relationships & people’s lives in post-war Britain). I have recently begun transcribing and analyzing the letters as I hope to create a book-length project out of the material stored in this unassuming suitcase. I would love to hear your thoughts and your response to this letter. I don’t really know how to start this letter. First I was going to thank you for coming down. But how can one thank another for a miracle. There just are no words. You have given me life. You have given me something I haven’t had, haven’t known since I was 19 years of age. Peace of mind, tranquillity, a clear conscience – happiness, darling. You’ve let loose a flood a flood of emotion – of love – for you. I’m pouring out my heart to you darling – I can’t keep it You’ve got to believe every word that comes, not from this pen, not from my thoughts. but from the depths of my heart. I may repeat myself, as I have no intention of reading this letter through afterwards, because it is not a letter, it is the pouring out of a soul released. It may be incoherent, you may even think I’m made. Perhaps I am, mad with happiness. There are not going to be any paragraphs. there may not be any punctuations But one thing I must make clear now. I don’t want, whatever I say to influence you in any way. Darling you know I love you with every breath I take I have never ceased to love you. but now with this incalculable difference. I will never ask you, in any way expect of you, anything that you do not feel in your heart you can give me. All I desire for the remainder of my life is your happiness. Knowing me as you did, you may have some doubts. You are bound to, you have every reason in the world to fear my the insane jealousy I had. Let me try to explain. For 19 years I’ve never forgiven myself for spoiling your chance of possible marriage, with someone you previously fo very fond of and to me, couldn’t possibly help loving you. Its [sic] been on my conscience ever since. I’ve never been able to do anything to redress it. Not in the smallest degree. on the few occasions I’ve seen you when Ive [sic] been walking up and down Newport platform waiting for your train, I’ve always brought this matter up. Perhaps you havnt [sic] noticed it but I’ve been trying to find out your thoughts and feelings in those very few minutes we’ve had. But I have never got any satisfaction to ease my peace of mind. I know you coudltn’ understand what I was trying to find out from you I couldn’t expect you to and every since, I saw you I was more and more depressed after leaving you, and now after all these years, I feel you’ve forgiven me. That is why I’ve got back my peace of mind. and I’ll never as long as I live, ever hurt you again. I’ll confess darling, I wasn’t looking forward to you coming down for the week end. I wasn’t looking forward to a holiday in Jersey. I never really wanted to see you passing through Newport in the train. It just hurt too much. Your friendliness wasn’t hurt me. It was no more, probably far less than you felt for your cats. Your kiss as the train was leaving was a knife in an open wound, I just couldn’t write to you. I ’phone you because you were the only friend I had. I always felt you were a true friend, but nothing more. Now, after these wonderful few days, I think you are fond of me, at any rate you have forgiven me. I don’t think you love me, I’m not daring to presume anything like that. But you have given me life. I’ve never wanted to die, but I’ve had nothing to live for. I’ve looked [?] talked breathed, but my mind was always in the past, there was no future. For years I’ve never looked to the future. There just wasn’t anything there. Everything was too much trouble Things irritated me. Getting my own tea was too much trouble breakfast the same. Even walking upstairs was an effort – I don’t mean physically – it was all mental. Getting u in the morning with nothing to look forward to. Going to the Pictures to kills an evening. Wondering how long I was going on like this. Going to Cardiff or Bach [?] for week ends because there was nothing else to do. And going to bed with horrible morbid thoughts, and taking pheno barbitone [sic phenobarbitone] to kill them. Not feeling up to my work, what would I do, when I retired? The two people most fond of me, my two sister, both over 70. What would happen when they’ve gone. Darling if you knew of could even guess at my state of mind, [?] you’ll probably wonder that I’m still sane. Probably I couldn’t be, if it hadn’t been for my pheno barbitone I can’t remember when I laughed last. I can’t remember anything except that I’ve always love you and that I suffered the fortresses of the dammed for 10 years before you went to Jersey. That I wondered just how long I could stand you coming up on Sundays, and to be so near you, and not to put even my little fingers near you. To look in your eyes, and see nothing there, after what I had seen years before. To pray to God at night, to ask for a little of the light I used to know. To pray that no one else would take you, and at the same time not being able to bear having you in the same room. Like a man dying of thirst in the desert with water just a yard away and not being able to reach it. But the man died, and I suffered it Sunday after Sunday, week after week, over and over again. While [?] I think I got aunhed [?]. and then you went to Jersey, and the torture cleared, and my love for you pwoul dered [?] like an ace night fire, and would have wukie [?] I died. and now you have re-kindled it with a burning flame, which will only die when I do. Please darling understand what I am saying. The last thing I want you to think is that I blame you in any way. You thought all that time no doubt that I wanted to see you every week and I don’t I think you could by any stretch of imaginations know what I was suffering. and above all, I had no right right even from the first I ever kissed you or baak [?] you would [?] to make love to you. I was not free to do so, and that is the irreparable harm I did to you. But now darling I am as free as any man in this world to love you I love you, I love you I love you. Till the end of all time I love you, and now I am free to say it, I love you a million more times than I ever did. For nearly 20 years I’ve loved you without anything in return, without any response of any kind, and I will go on looking you if necessary without asking any more of you, than that you will be as sweet to me as you were last week end. I’ve never been so happy. You haven’t been out of my thoughts since you went. I don’t want to go to bed, because it means I d ?] have stop thinking of you for a few yours, until I awake again. I can throw away my pheuo [?] barbitoue [? ], because if I can’t sleep I can think of you whereas I used to think of death. But it did save my season, perhaps my life, so now I shall always be thankful for it. You’ve changed everything darling. I can laugh again, I’m supremely happy. My work has suddenly become easy. I like men again. Things have happened in the office since you were that would have irritated me or got me bad tempered, but I have pureed [?] and they haven’t had the slightest effect. Even Maurice’s wife didn’t get on my nerves last night I quite like her. I feel I could [?] to be friends with everybody now. But most of all I want to see you again. To be with you again, and yet when I’m with you, I feel any awful restraint. I want to hold you in my arms and kiss you forever, and I’m afraid, so afraid darling that you don’t want me to, and I don’t want to do anything to upset you in the smallest degree. I don’t ask for anything except to love you. I don’t want to influence you in any way. and I mean this from the bottom of my heart and I want you to write to me and tell me you will not be influenced in any way, by what I am going to say now – I cannot bear you to go away, so far far away for three years. Please understand darling if you want to, you must go. I only wish I could give you the material things that this job will give you. You know I would give you anything in the world if it were in my power to do so. I feel I ought not to have mentioned this, but I couldn’t keep it darling. Just one last thing. This letter is me, now and always, whatever happens, always remember this. If I am restrained at any time, either with you or on the ’phone, or under any circumstances, I cannot help myself. Please don’t let us have any more misunderstandings. This letter is written with the pen and the original nib, you gave me many years ago. And I want this letter to be waiting for you when you arrive back in Jersey.